It's called For Honor, not For Falling Off Stuff To Your Death A Lot. With the launch of For Honor, hundreds of glory-hungry alpha and beta players are gleefully awaiting fresh meat to kick off the nearest cliff-face. If you’re looking to get into the game’s complex and rewarding combat system, we’ve gathered some key tips to help you avoid embarrassment during your early hours. When you first start For Honor, you’ll be thrust into the game’s basic tutorial. While this does a fair job of introducing you to the core combat mechanics, it skimps on some crucial aspects you’ll want to know. Hop back to the How to Play menu and you’ll find an Advanced Tutorial that’s well worth your time. Covering guard-break cancels, feints and parrying, this tutorial details some of the most valuable tools in your arsenal, so watch it. Each character has a unique moveset, and while the game offers individual videos for each class, the best way to practice is by duelling bots. You’ll still gain XP for matches, so work on your combos before heading online. Some characters, like Orochi and Valkyrie, have unique blocks and counters you’ll need to learn the timing for. 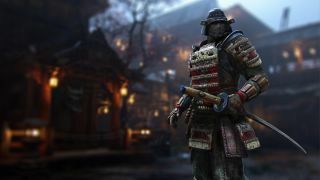 At its heart For Honor is a fighting game, and just like Street Fighter or Mortal Kombat, mashing the attack buttons will only get you so far. Every move has an energy cost, displayed via a stamina meter below your health bar. Throw out too many attacks and your character will become exhausted and sluggish. Maintaining a balance between attacking a recouping stamina is vital to survive in extended duels. From cliffs to rivers of lava and spiked walls, the maps are littered with danger zones. Environmental kills are quick and dirty, but a great way to turn around a losing battle, so keep an eye on your surroundings and lure enemies to an edge if needed. Be warned though, you’ll need to make sure you’ve mastered guard-break counters or you’ll find that it’s you tumbling to an early grave more often than not. Useful surroundings aren’t limited to cliffs, however: throw an enemy into a wall and you’ll stagger them. Some characters like the Raider benefit from this more than others, delivering a stunning knee to the head afterwards. Despite being the poster child during the game’s promotion, Dominion’s 4v4 battles are awful for learning how to fight. Control points, feats and power ups all provide distractions, making straight duels a rare occurrence. The mode is also prone to grouping, with three or four enemies ganging together on an individual defender. 1v1 and 2v2 Duels offer the best opportunity to hone your talent, but expect to face stiffer competition there than in other modes. Land a killing blow with a heavy attack, and you’ll be granted the opportunity for an execution. Beyond providing a flashy way to finish your opponent, these confer some valuable advantages. Kills via execution cause a longer respawn timer and heal you. The longer the execution, the more health you recover. Even more crucially, players who’ve been executed cannot be revived (usually due to the loss of a head). In modes without respawns this can prove a decisive factor. A surprisingly unknown fact in Dominion is that control points (excluding the minion wave point) earn double score with a player on them, so it’s worth leaving someone to guard each. This can be an effective way to counter large groups of players roaming the map for kills. Running away while your team holds the other two points can comfortably secure the lead. Group up once the enemy is breaking to eliminate them for good. Shugoki is an enormous mountain of a man, clad in a fearsome Oni mask and wielding a spiked club. He’s as heavy as heavyweights come and is built to catch new players out. By default, Shugoki can take a single blow without flinching, letting him tank a hit to land a heavier one in return. A quick jab or guard-break will drop his armour, allowing you to deal extra damage. Watch for a shimmer of light to signify when his defence is back up. Additionally, Shugoki has a slow but devastating life-steal grab. If he's low on health, this is a match-finishing one-shot-kill. Look for the tell-tale squat and be ready to dodge sideways. If he misses, he’ll sacrifice a large chunk of his own health. Conqueror, Warlord and—to a lesser degree—Valkyrie all posses shields with superior blocking abilities. The former two are both capable of blocking attacks in all directions at once by draining their own stamina. Fighting against a skilled player can seem an exercise in frustration, but they can be dealt with through patience and trickery. Try cancelling a feint into a guard-break, or change to strike in another direction. Mobile characters like Orochi fare well here. Valkyrie and Nobushi are spear-wielders whose job is to keep you outside of usual combat range and inflict death via poking. By far the more aggressive of the two, Valkyrie can culminate a number of options with a shield bash or leg sweep. Nobushi plays a more patient game, inflicting bleed damage with swift jabs to wear opponents down. Her “hidden stance” allows her a brief moment of invincibility, dodging all attacks at the cost of a decent chunk of stamina. Block and parries will help move you closer and allow you to put them on the back foot.